The Tocal Agricultural Production program is delivered under the AHC30116 Certificate III in Agriculture. It is a 1 year, full-time course designed to give students a wide range of practical farm skills and the underpinning knowledge to begin their career in a variety of agricultural industries. This course trains students for entry into a wide range of agricultural industries including beef, horse, cropping, sheep, poultry and dairy industries. Most students continue onto the Certificate IV in Agriculture course before seeking employment in these industries. Year 10 or equivalent. Some students may benefit from completion of year 12. Case studies: students work in small groups to investigate issues affecting all types of agricultural production. Practical work: about half the course involves practical training on College and local commercial farms. Students learn about beef and dairy cattle, horses, farm machinery, crops and pastures, sheep, poultry, fencing, chainsaws and general farm skills. Farm skills: students learn a wide range of practical farm skills to equip them for their first job on the land. Farm safety: an emphasis is given to safe working practices in all areas of farming. Specific units cover WHS, First Aid, emergency response and chemical use. Individual studies: self directed learning projects in students’ areas of interest. Tocal College has up-to-date training facilities and equipment. 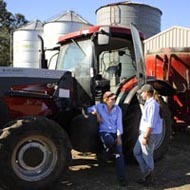 It also has the resources of Tocal's commercial and demonstration farm enterprises including beef, dairy, sheep, horses, poultry and cropping. Fees are charged for board and lodging (includes room and all meals), tours, student association fees, equipment and resources used in the course. They also include the Smart and Skilled Student Fee. Fees are payable at the start of each term or by fortnightly instalments. There are a large number of scholarships available for students enrolled at Tocal. Application forms are available under scholarships or from the college prospectus. Most students also qualify for Youth Allowance or Abstudy which may cover most fees (contact Centrelink for more information).